Bvlgari BLV Notte Pour Femme absorbed the magic and the stillness of the night air. 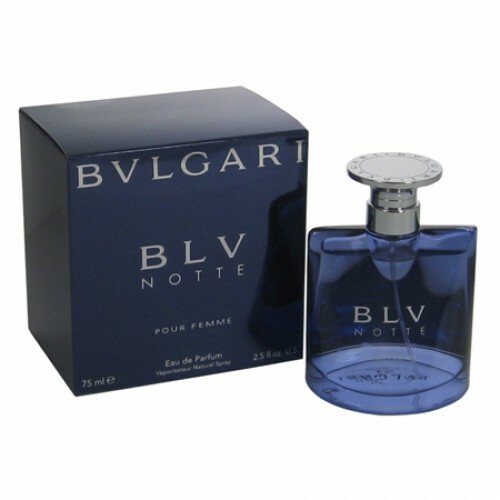 Bvlgari BLV Notte Pour Femme 75ml. Eau De Parfum - BLV NOTTE iris combine sophisticated and feminine with pure essences of galanga. Like the smell of a clear night, brings a state of mystery and an unmistakable aroma of dark chocolate, thus raising a state of intimacy, acting as a true aphrodisiac. These seductive tones and elegant arrangements continue mandarin, bergamot and ginger. Vodka, acacia, iris and tobacco, are a source that exudes femininity, while amber and incense crowns the best piece of dark chocolate as a forbidden fruit'' true''. Sensual and mysterious, new fragrance BLV Notte pour Femme by Bvlgari Parfums, absorbed the magic and the stillness of the night air, reveals the most secret and mysterious side of BLV. Bright chord mandarin and bergamot, subtle notes of ginger Galang and sophistication reinforce perception. Unusual perfume component vodka creates a special mood of the night, the notes of acacia, iris and tobacco emphasize the extraordinary feminine fragrance smells of amber and incense give warmth, enveloping aroma of dark chocolate fascinates and excites consciousness. Luxury perfume Bvlgari Notte pour Femme, woven from the sensually intoxicating aroma night of mystery, seduce and attract to yourself. Mysterious aroma of Bulgari pour Hom Pham - the very embodiment of the night - Black, promising and voluptuous, enveloping notes expensive dark chocolate and vodka. Overnight Bvlgari shades approaching Galang fascinating, filled with mysterious undertones iris. loop Spicy sensuality and appeal reveals hints of dark chocolate and vodka. Notte Perfume Bvlgari pour Femme - a scent of an unforgettable night that envelops its possessor magical chocolate "aftertaste". The creator of the enchanting fragrance, giving an unforgettable experience - the magician odors Alberto Morillas (Alberto Morillas).